The statistic presents the most costly insurance losses worldwide from 1970 to 2017. It was found that hurricane Katrina, hitting the United States and Gulf of Mexico in 2005, was the most expensive disaster since 1970, as it incurred insured losses amounting to approximately 82.39 billion U.S. dollars. Insuring is the practice of transferring risk from one entity to another in exchange for payment. It is important, especially if one lives, owns property or a business in an area prone to natural disasters, to take out coverage for a range of storms, catastrophic events and natural disasters that could cause damage to real estate. When considering this type of insurance it is important to ask a lot of the important questions up front. How long will it take for a claim to be settled for example, not all insurers settle claims with the same speed. Many also provide specific exclusions, be they for floods, earthquakes or other types of natural events. A detailed inspection of exclusions in a policy is important in order to find out which coverage is still needed. Obviously, the extent of coverage that one should take out is wholly dependant on the area in which one lives, in the United States, as well as in the rest of the world, there are low risk areas and there are high risk areas. Despite this, no one can be sure where a natural disaster will occur and the severity of the destruction it could bring with it when it does, no one can stop natural disasters or the economic impact that they have but insurance helps to mitigate the loss caused by them. Property and business interruption, excluding liability and life insurance losses. 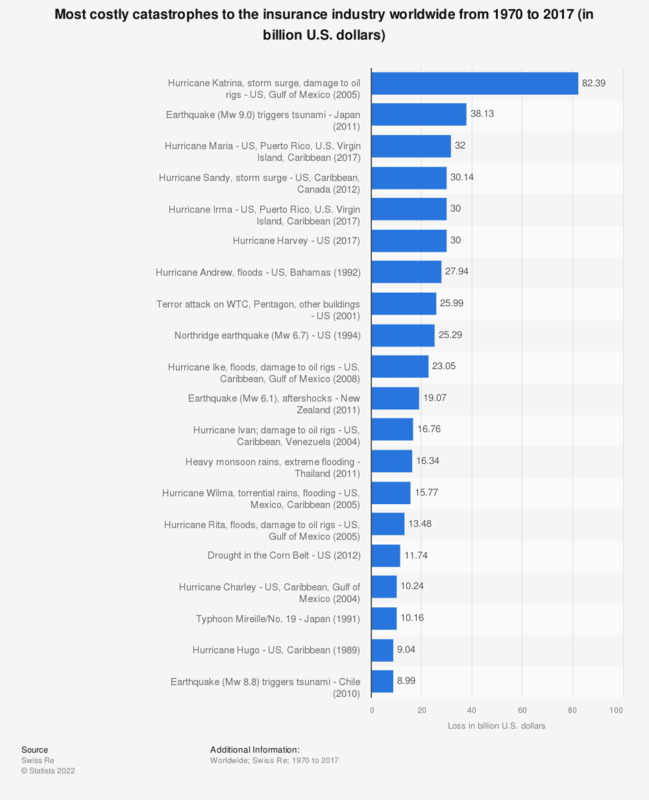 U.S. natural catastrophe figures based on Property Claim Services, including National Flood Insurance Program losses. Adjusted to 2017 U.S. dollars by Swiss Re. Mw = moment magnitude scale.